Click here to download the complete Organic Mantras recipe diary. Celebrate summer with this yummy popsicle recipe. The creativity of the popsicle lies in the ingredients. The perfect blend of sugar and citrus with little spurts of flavour blasts as you slurp past every layer of this ingenious popsicle. 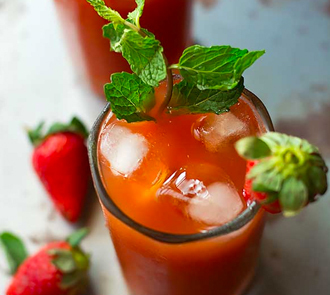 Mixed fruit juice and the strawberry puree goes so well together, and the best part is that people of all ages can enjoy this recipe on a warm summer noon. We know you can’t wait to get your hands on one of these, so try it out today! Add in your favourite fruits, try it with a totally different flavour of juice and tell how much you loved this recipe. This beautiful double layer chocolate cake is a fantasy for any chocolate lover. 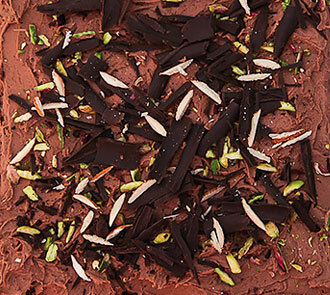 Sweetened to perfection with organic sugar and Topped with a generous sprinkle of the flavourful and crunchy almonds, pistachio and chocolate gratings. The overall combination of the chocolate fudge and the chocolate cake is just divine. You can bake this marvellous cake for birthdays, house warming parties, or any gathering where everyone loves chocolate. We are sure you are already drooling all over this cake, so stop drooling and grab your chef’s hat. Try this recipe and tell us how much you loved it. The sublime taste of Masala Bhath and the beautiful aromas it leaves in the house is truly divine. The spices used in this preparation is what is the true essence of the recipe. Goda Masala is very easy to make and it really elevates the taste of the rice and the vegetables that you add. To make this healthy you can add many different types of vegetables of your choice and let us know which one you liked best by leaving us a nice comment. This recipe makes for one of the most gratifying meals so go ahead and try this for a meal next Sunday with your family. 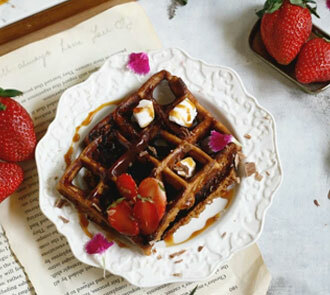 This is the third waffle recipe in The Organic Mantras recipe diary. And what a beautiful recipe it is. Churro waffles are just the things you need to energise your day. Fluffy waffles inside with a crispy exterior. Pair those waffles with fresh strawberries and marshmallows. Just the thought of that in the morning will make your kids get up early for breakfast. The mocha sauce is the flavour & the soul of the recipe. 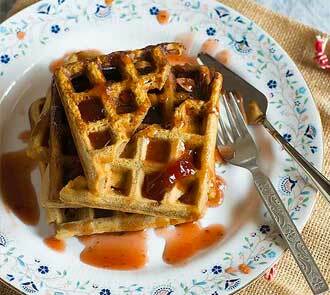 If you are a fan of waffles then you are gonna love this recipe. Try it out and have a truly memorable breakfast with your friends and family, You don’t need an occasion to have a nice breakfast, so happy breakfasting. Who says you can’t make snack bars within the comfort of your home. It is extremely easy to make and boy this is a super healthy snack in comparison to the sugary snack bars available in the market. 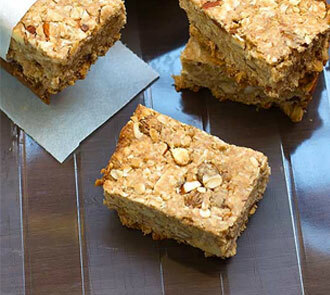 Made with the goodness of whole wheat flour, the flavour and the crunch with the almonds & raisins. The Flax seeds in the bars truly make this dish extremely healthy. This breakfast bar is for a quick bite when you are hungry and it has all the energy to keep you going hunger free for a long time. Your kids are gonna love it and you will be sure that they are getting the nutrition they require in one yummy delicious snack bar. Want to seamlessly incorporate brown rice into your diet a whole grain that is not only gluten-free but also a natural source of dietary fiber. then this is the perfect recipe for you. 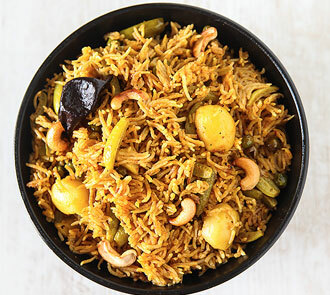 This not only preserves the nutritional value of brown rice, it also camouflages the taste and gives your adai a perfect texture and brings that super crispiness. Rest assured that your kids are gonna love this brilliant dish. 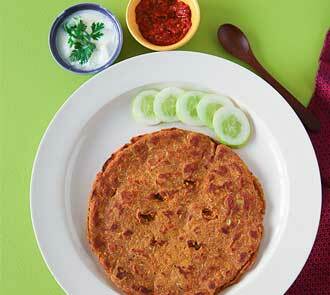 Serve this brown rice adai with aviyal, butter, jaggery, molaghapodi and chutneys of your choice. Organic lentils, Pasta, organic herbs and spices, a generous grating of cheese, and lets not forget all the healthy veggies that you would like to add. All these flavours and aromas come together to make one hell of a dish. This soup, unlike others, can become your one bowl dinner meal as it contains all the nutrients and nourishment that one needs in a meal. What’s even better is that this dish consumes very little time and is made with so much ease that you would choose to make this every single day. This one pot meal is a real blessing in the sense that it can really accentuate the flavour profile of every small little ingredient. So if you are a fan of continental cuisine and want to surprise your friends and family with an italian dish with a fun twist to it then you must try this dish. Who said you need yeast or you need an oven to make a delicious cheesy pizza. I mean what can get better than homemade whole-wheat pizzas, with ingredients that you can find in your house. So if you are looking for a happy little pizza recipe to lighten up your spirits and mood then you can call off your search right away. Once you have a crisp pizza base all you need to do is assemble the rest of the ingredients. You can start by spreading the tomato sauce, then sprinkle some chopped bell peppers, olives and a generous shower of mozzarella cheese, and finally spoon a few drops of oil on the sides, cover the pizza and cook until the cheese melts. Viola, in a matter of a couple of simple and easy to follow steps, your whole wheat, no yeast and no oven pizza is ready to be devoured. Dals are an everyday delicacy of Indian cuisine and it takes care of your day to day protein requirement especially if you are a vegetarian. And when you choose to go organic, the taste, flavour and everything else about the recipe gets enhanced. 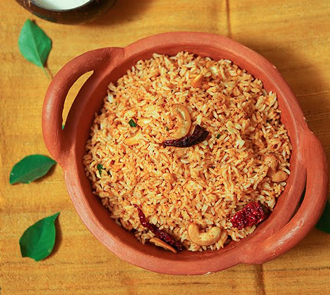 Serve it rice for lunch, or with chapati for dinner and you will be guaranteed a homely and heartwarming recipe. Many of you would have tried Iced teas in a cafe or a restaurant, but what if we told you that you could get an equally refreshing iced tea in the comfort of your own home, well making this iced tea is extremely simple and you can change up the flavour of the iced tea based on your preference. Strawberries are in season right now and if you have the chance you must go out to the market and get some fresh strawberries for this recipe. So go ahead, check out this recipe and in a few simple steps, your Organic Iced Strawberry Tea recipe is ready. Try it out, and make sure you make a lot of it and keep it nice and cold in the fridge so that you can keep coming back for refills. 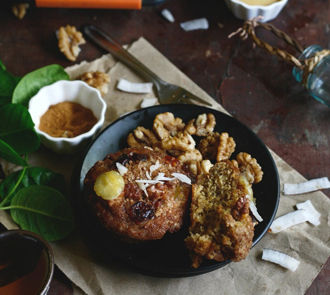 Imagine how it would feel to start your day with a gluten-free vegan recipe that will deliver the proteins that you need to kick start your day. 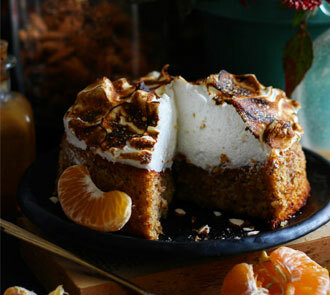 But that’s not all, this recipe is exceptionally tasty and can definitely break the monotony of your boring breakfast. 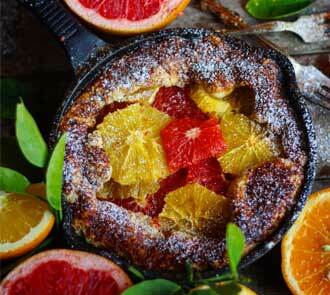 In just a few simple easy to follow steps you can create this beautiful recipe. Seriously all it takes is 30 min to make, and you can even have this for lunch or an evening snack if you like. So go ahead, try out this splendid recipe and go ahead and add your own indian flavour to it, tell us how you made it your own and how much you loved eating this beautiful dish. Wanna add some spice to your life, here is a brilliant Jodhpuri recipe that will help you do just that. Get some big green chilli peppers stuffed them with spicy aloo masala coat them with some besan batter, fry them and serve them with spicy green chutney and sweet tamarind chutney. Right from the kids to the oldies, every single person is going to love this recipe. This dish can be made in a couple of simple steps. 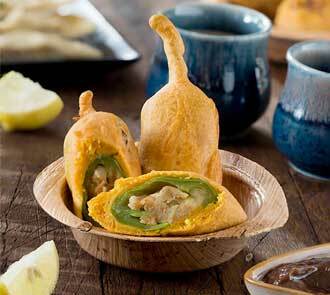 Mirchi Vada is a perfect snack to serve your guests with your evening tea. 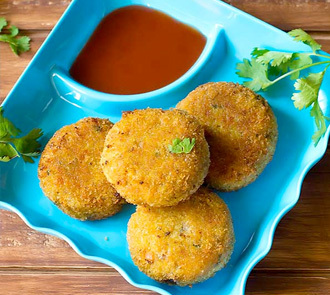 What distinguishes this recipe from the rest of the mirchi vada recipes is the fact that it is extremely healthy and is made with organic besan flour, organic spices and even deep fried in organic peanut oil. You can take our word for the fact that going organic makes a huge difference to the overall taste. So try it for yourself and you are in for a pleasant surprise. Here is a traditional Maharashtrian recipe made with 4 types of flours. 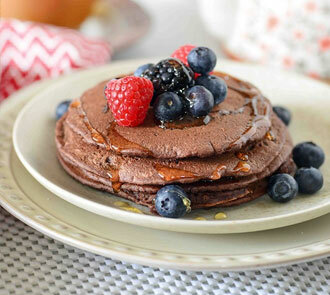 A nutritious pancake made with different kinds of flours, making it delicious and more importantly nutritious also. You can add vegetables of your choice to make it more nutritious. The Vegetables used In this recipe are carrots, cucumbers, pumpkin or bottle gourd and the results have been superb. Pair it with some homemade curd and some spicy red chili chutney called ranjak or kempu chutney for the most satisfying experience. 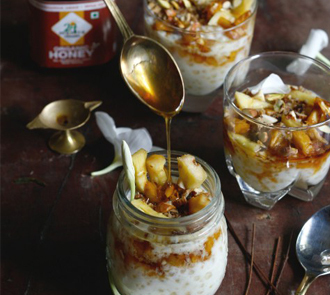 You can also choose to have it with some Mango Chutny or some amla chutney as well. Try this recipe today and do let us know how much your friends and family loved it. Every once in a while, you tend to get this feeling inside that says I want to eat some yummy pie. Well whenever you get that feeling all you need to do is put on your apron, get all the ingredients together and check out this amazing recipe. 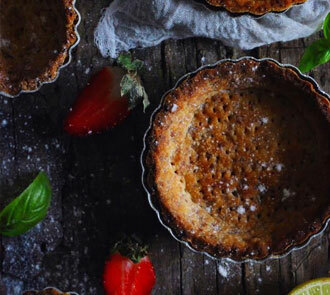 This homemade pie has the perfect flaky buttery crust that you would have tasted. 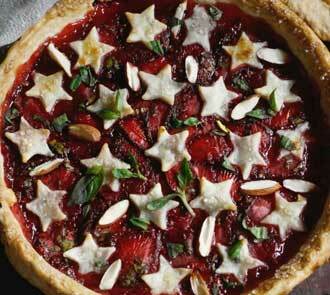 What’s even better is the strawberry flavour that oozes out of this pie as you sink your teeth into it. After a taste of this, one slice of pie isnt gonna cut it. We bet your gonna go back for more so make sure you make a big enough pie. Try this recipe with your friends and family. Spaghetti and meatballs a traditional Italian recipe that vegetarians can’t enjoy. Well think again, this recipe just got a vegetarian twist to it. 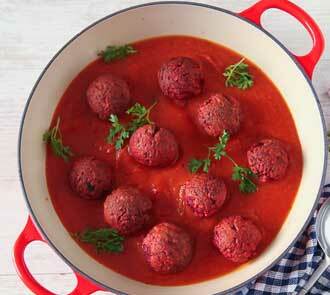 These vegetarian kofta balls in tomato sauce is an amazing dish that can be had with spaghetti. 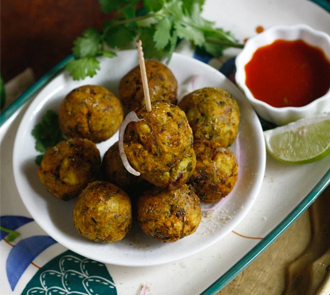 The gram flour in the kofta balls is protein rich and the vegetables add many nutrients to them. These kofta balls are quite versatile. You can fold them into any curry or sauce of your choice or even dunk them into a kadhi to eat with rice. try out this beautiful recipe today and tell us how much you enjoyed it. If you think about a Punjabi style dish that is evergreen, easy to make and super tasty then we are sure that the Dal Makhni is one dish which will definitely feature on that list. The aroma, taste and pleasant flavours of this spectacular dish is truly captivating. You can pair it with some amazing Basmati rice, have it with some laccha Parathas, Naans or Rumali Rotis, or you can even have it without anything at all. 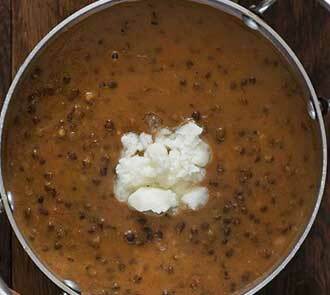 This Dal Makhni however is a little different. How? well it comes with a health twist, so if you are a fan of this recipe but dont want to compromise on the health factor then you must try out this dish. So what are you waiting for, try this wonderful recipe today! Want to add some protein and carbs in your diet, then we’ve got just the recipe you are looking for. Kala channa or brown channa is a very good source of protein especially for a vegetarian and let’s not forget that organic basmati rice is an excellent source of carbohydrates. What makes this recipe even more spectacular is the simplicity with which it can be made and how exquisite it actually tastes. The soothing taste of this recipe can be attributed to the organic spices used to prepare this dish.Pair it with a nice pomegranate raita and make it one of the most satisfying meals ever. Go ahead try this recipe today, it’s extremely easy to make and we are sure that your whole family will love it. The flavour of organic spices with a blended of some typical Punjabi tadka, tossing up some khanda, tomatoes, sev, adding some healthy sookhi urad dal and topping this extremely simple dish with a squeeze of lime and generous sprincle of coriander leaves can take you to a state of ultimate nirvana. Each flavour bursting in your mouth to create foodgasmic sensations. We bet you are as excited as we are to try out this extremely easy and delicious dish. So without wasting any more time head to your kitchen and try this splendid recipe today. Have you ever been to a party where everything stops when they bring out the food! 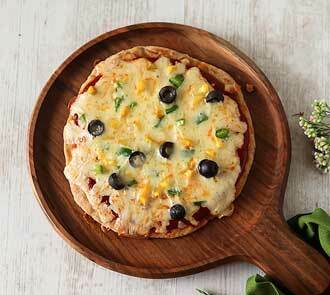 Well, you can expect the same reaction when you bring out this super cool gourmet style naan pizzas for your guests. And we are sure you already realise what an insane crowd-pleaser they are gonna be. Easy to eat finger food to fuel some amazing conversations and literally kick start your party. 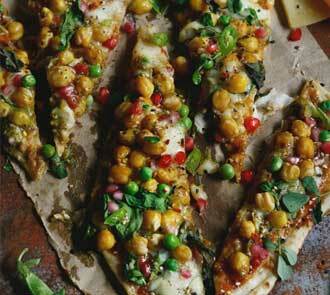 the creamy falvour of Mozzarella & cheddar cheese combined with some basil, pesto, and zaatar spices just gives these naan pizzas that captivating and enticing flavour profile. 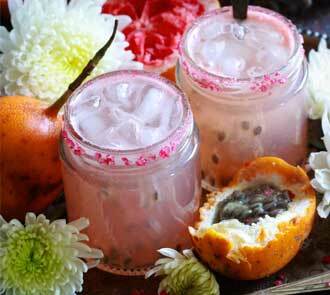 Tyr out this recipe next time you are throwing a party and let us know how much you enjoyed it. Apart from being gluten free, egg free & butter free we have the good fortune that these are made from ragi flour, flax seeds which are extremely healthy some almonds and cashews to give it that crunch and an amazing burst of flavours and last but not the least the textures, aromas and flavours of our addictive organic honey and creamy peanut butter. This recipe is a must try this festive season. Spread some love and happiness by welcoming your guests with this super tasty treat. when hunger pangs start drumming away you know you have to do something about it and what better way to control these hunger pangs than to make these amazing delicacies from eastern UP. India has diverse food culture and this recipe is something that not many of you may have known about, but we assure you that these can please anyone’s craving for a scrumptious and healthy meal. But be sure to follow the recipe step by step so that you don’t get stuck at the critical pressure points. Try this recipe today and don’t forget to let us know how much your friends and family loved this splendid recipe from the streets of Chattisgarh. 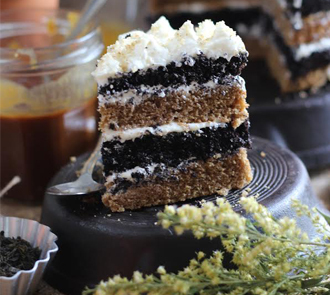 We are sure you are drooling already after taking a look at this marvelous recipe. 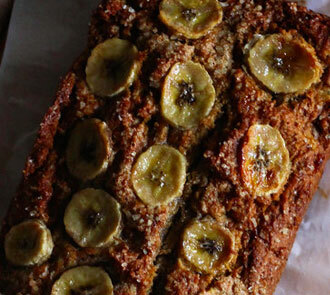 It has all the ingredients that will make you sneak back into the kitchen for more. 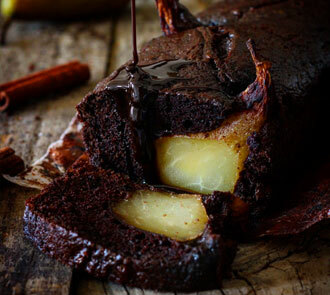 Anyone who is a chocolate fan will love this recipe because it is an overload of chocolate right from the brownie itself to the melted glazed Nutella fudge that you drizzle on top of this beautiful dish. 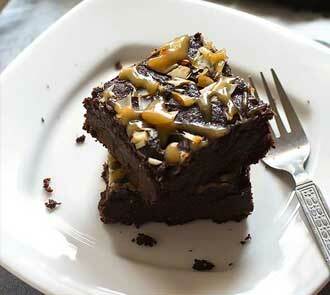 This dessert will make you say goodbye to your diet plan because it is truly irresistible. So why don’t you try this recipe and dig into this gooey, fudgy, delightful brownie on new years eve with your friends and family? When you go to Gujarat you will understand how important farsan is to a true Gujarati. From the Theplas to the Fafdas to the Khandwis and the Dhoklas everything about their food is so different and filled with love. With that being said you needn’t doubt for a moment how incredible this traditional Gujarati dish tastes.You can have it with pudina chutney for that awesome flavour and you will agree to the fact that it makes for an exquisite tea time treat. So go on and try this wonderful Na Muthia recipe with your friends and family and live a guilt-free organic life. 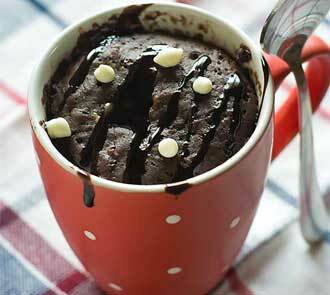 An eggless organic Chocolate Peanut Butter Mug Cake, sounds delicious right? You bet! It’s these simple and wonderful recipes that are the most satisfying. 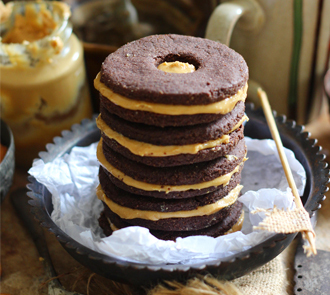 Imagine sitting with a mug underneath your blanket and relishing this gooey chocolate cake with peanut butter oozing out of it in the middle. Don’t you wanna get your hands on this fantastic recipe. 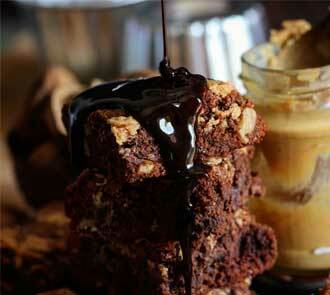 We are sure you are tempted, so check out the recipe and get cracking. And this will make for an awesome new years party dessert. That is considering you have enough number of mugs to serve your guests 2 servings! When you talk about waffles you’ve got one important decision to make, whether to eat them hot or cold. We’re sure you all agree that these lovely gingerbread waffles drizzling with honey and strawberry jam syrup are the stuff legends are made of. I mean what else will one need in life. And like we said earlier, you can even enjoy these waffles with a dollop of ice cream and some Nutella chocolate sauce. And don’t worry if you don’t have a waffle iron you don’t have to miss out on the Whole wheat gingerbread awesomeness just because of that. 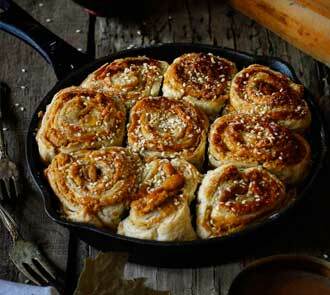 Try the recipe on a pan, We assure you it tastes brilliant that way too. A true Rajasthani would tell you that Panchmel Dal is best had with Freshly roasted Bhati, and they would be right, there would be no better combo. 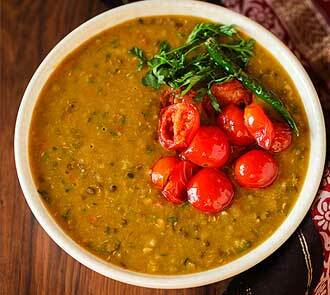 The aroma of this beautiful, healthy and homely dal is truly mesmerizing. the texture and the consistency of a dal are what differentiates a mediocre dal from a delightful mouthwatering delicacy. So pay close attention when you are making the dish. You can even have this beautiful dish with some perfectly cooked basmati rice with just a drizzle of glee for a little indulgence. Don’t forget to try out and tell us how much you loved this marvelous recipe. Experience the journey that inspired the creation of these delicious cookies. You can welcome Santa this season with this mouthwatering heavenly cookie recipe that will make sure that he will visit your house first next Christmas. And Santa’s gonna be a lot healthier with these cookies because they are loaded with the goodness of organic whole wheat, unprocessed organic sugar and lets not forgot about the ginger. 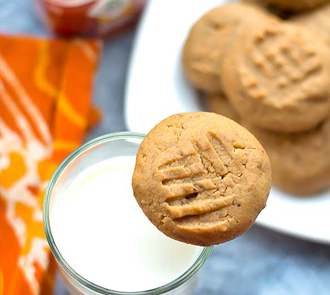 Pair these yummy cookies with some milk and relish each crisp, soft, sugary bite that you take. 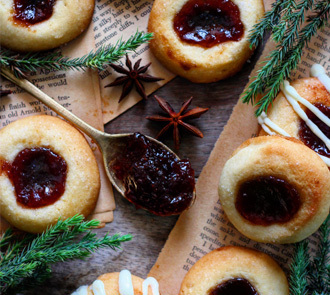 Enjoy these yummy cookies with your family and friends this Christmas. Apart from the fact that this is an extremely delicious recipe that many of us cannot resist this also happens to be an extremely healthy dish that will load you up with the energy, strength, and stamina to tackle your entire day. I mean, just look at all the ingredients and you will know for yourself. You have the Organic Moong Dal, pureed spinach, Coriander powder, green chillis, lemon juice, and it’s made in the healthiest organic peanut oil. All of this coming together to make one delicious Andhra style dish. Don’t miss out on this recipe, try it out tomorrow for breakfast and tell us how energized you felt the whole day. Now you can welcome Christmas and all your guests with open arms and not worry about what you are going to serve them. Although this dish is exquisite and is an absolute work of art, believe it or not, it is not that difficult to replicate. 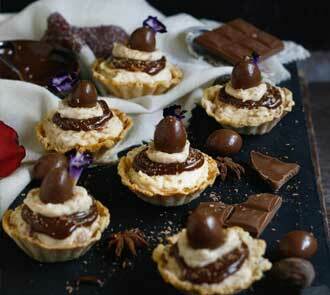 All it takes is a little patience, some chocolate, some peanut butter and some tarts. And trust us when we tell you that this recipe is a total show stopper. I mean just look at it, doesn’t it make you jump out of your seat and head to your kitchen and whip up this fantastic dish? Well if it does then what are you waiting for? go and try out this amazing recipe today. If you ask people in Maharashtra what they generally eat for breakfast then we are positive that Misal will definitely feature on the list. 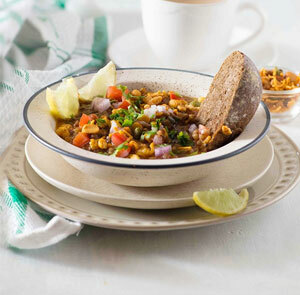 Misal pao as they call it is something that is extremely healthy and can keep your hunger pangs in control right until lunch. The moong dal misal is something that can is topped with a variety of garnishes like sev, fresh coriander, chopped onion, chili tomatoes and lemon juice. Just the thought of this wonderful healthy fulfilling dish can take you back to the streets of Maharashtra. And now you can bring the streets of Maharashtra to your kitchen. Just try this fantastic recipe and tell us how much you enjoyed making this delicious dish. A delicious, easy, vegan and gluten free appetizer recipe that you shouldn’t miss this festive season. We are sure your friends and family would love these organic chickpea Plantain Koftas. It literally takes 20 Min which means you dont have to spend hours in the kitchen. With Christmas and New year just around the corner, you really need to arm yourselves with some easy to make croud pleaser recipes and this is just what the doctor ordered for those Situations. So dont hesitate, just try out this Wonderful recipe and tell us how much you loved the dish. Thenum Thinai Maavum as they call it in Tamil is generally served as prasad after a Pooja, this easy, simple and extremely yummy recipe will take you literally 20 Min to make. That’s it, I mean who would have thought a delicious and healthy millet honey laddoo ready for you to enjoy in such a short period of time. 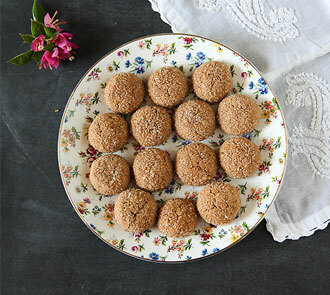 Just the sight of these lovely laddoos is so tantalizing, and one can only imagine the crunch when you bite into those healthy organic dry fruits in every little ladoo. This is literally a super cure for someone with a sweet tooth. With so much health, you can choose to indulge a little. Try this recipe today and tell us how much you liked it! When you really think about it Mexican food and Indian food are very similar, The Mexicans have the Tortillas and we have our roti,they stuff their tortillas with protein-filled beans and veggies, we have our rotis with sabji. And let us all face the fact that both cultures love their spice. Both cuisines are so similar that a dish from Mehico can very well be a super replacement for your day in day out Indian Ghar ka khana. But really think about it, it’s extremely easy to make, we are sure that your kids will not waste a morsel of it because you will tell them it’s a Mexican dish. They will love it and you will be satisfied because of the fact that it is filled with so much nutrition. That is literally like a win win for us all. So try out this recipe today and tell us how much you loved it. 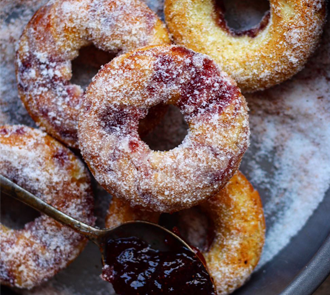 Just saying the name of this dish out loud will make you go into a Muffin filled fantasy land. With the wholesome goodness of Banana & coconut and the crunchy walnuts with the beautiful flavour of Creamy peanut butter can tantalize anyone’s taste buds. I mean how can someone possibly resist such a delightful recipe. 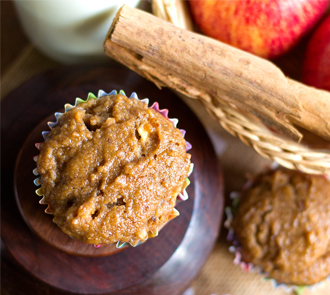 Basically, this dish is a super nutritional muffin that will satisfy any kid’s sweet tooth. Try it our, ask your kid if he or she liked it, and if they did make some more of it. And dont forget to share this recipe with your friends and family, we are sure they will like it too. This soft, buttery and extremely nutritious middle eastern dip is something that some of us have had the good fortune to taste. Paired with pita bread it makes for one of the most authentic Lebanese dishes ever. But have you tried it with some sumac roasted vegetables and some black pepper rice? 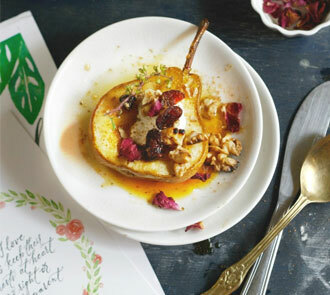 This dish presented by Anushruti RK is truly exquisite and is a spectacular addition to our Organic Mantras Recipe Diary. The spice of the Black Pepper, the flavour of the Turmeric, the smokiness of the roasted vegetables and the creaminess of the Hummus, need I say more. Don’t miss out on this recipe. Try it out today! Organic Chana aloo or Chole aloo a rustic Punjabi dish made with organic Kabuli Channa. The Organic Basmati rice cooked to perfection partnered with this delicious Chole aloo is all you need to make a completely fulfilling meal for you and your family. 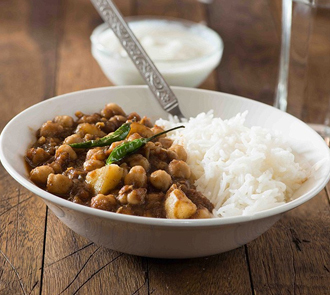 We are sure that at some point in time you all must have had this all time epic Chana Aloo and rice combo. So don’t just reminisce in the past guys. You have to try this recipe and tell us how you enjoyed it by leaving us a comment. 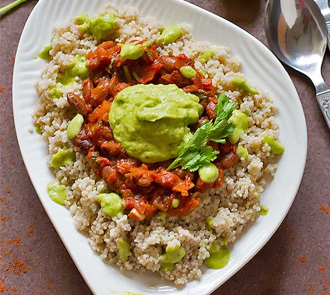 This Burrito Bowl is made with Barnyard Millet and topped with a creamy Avocado Mint sauce not only for the the oomph…factor but also for the added taste and for extra moisture. Scoop the flesh of the avocado and add it to a mixie jar or food processor. Add mint leaves and the rest of the ingredients for the sauce. Finally add and spread the cooked millet scoop a ladle full of spicy kidney beans onto the centre and top it with avocado mint sauce. Enjoy this amazing recipe with your family and tell us how much you loved the recipe. Health, nutrition, fibre, taste, and all the goodness of organic in an amazing breakfast bowl that will change the way you wake up in the morning. 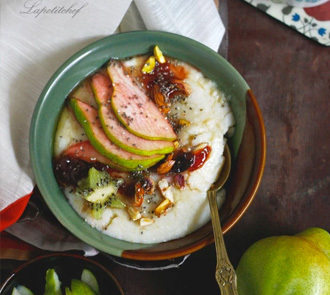 Organic vegan millet porridge is the next breakfast to turn to when you are bored of the same old boring breakfast. Cooked in fragrant coconut milk, these extremely nutritious and gluten free millet are just as delicious eaten sweet. Topped with pomegranate poached pears, kiwi, cranberry chutney, chia seeds,pistachios,walnuts and almond flakes for a healthy and wholesome breakfast. 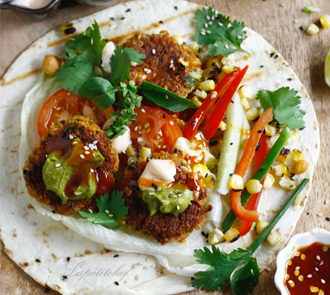 Organic Chickpea and Oats Pattie is a super cool, easy to make healthy vegan dish which can be made very quickly and easily. You can wrap the patties in some tortillas and load them up with your favorite veggies. 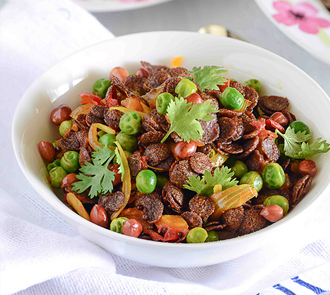 This recipe by @lapetitchef is a must try dish for all the health freaks as it is loaded with lots of nutrition, fibre and it also makes for a super tasty dish. Just click on the link below to check out the complete recipe. Rajma galouti Kababs are aromatic and they literally melt in your mouth as soon as you dunk them inside. These kebabs are Soft inside and crisp outside. 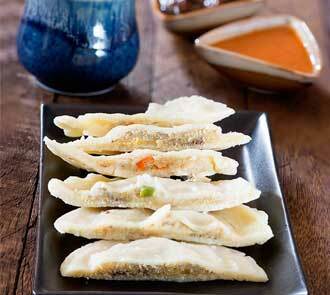 The cashew paste and Paneer gives it a soft texture and a delightful taste. Apart from the Rajma this recipe also has some Millet and quinoa which not only makes it wholesome but adds a wonderful crispy layer outside. This recipe is a tasty tea time snack, appetizer or can even be a healthy treat your kids can carry in their lunchbox. There are so many unique ways to serve it and we want to know how you like to enjoy these kebabs. So just click on the link below for the complete recipe. We are sure of thing, and we know for a fact that you wouldn’t disagree to the fact that these fruit and nut cupcakes are to die for. The taste of the cashews, almonds and raisins in every bite with the beautiful texture of the soft spongy moist cake creating a flavour so wonderful that you get lost in time till you finish every morsel. The honey icing seeps into the cupcake and merges with it nicely, giving the cupcakes a fruity flavor and earthy taste. 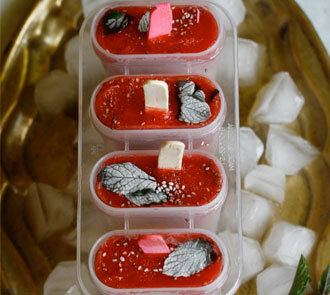 So its time for you to try this recipe out for Christmas and enjoy this with your family and friends. A delicious, eggless, fusion starter or appetizer combining the Italian Arancini balls and the Indian Kebab. All of this using Organic Kodo Millet from 24 Mantra Organic. 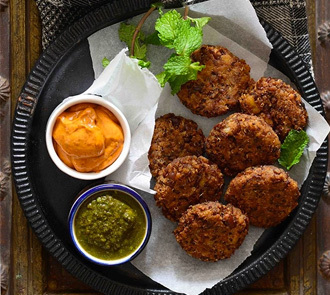 These kababs look absolutely lip smacking and taste even better. 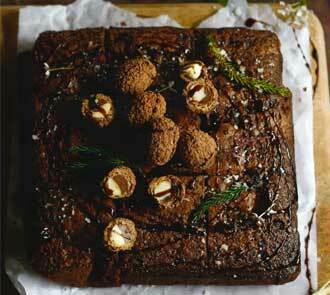 Millets are ancient grains, no doubt but we don’t have to stick to the traditional stuff, do we? We have to switch things up a bit sometimes, indulge a little and that’s what makes this an awesome recipe. Not only is this a heavenly snack that you can enjoy sitting back on your couch, but they are incredibly healthy. Now, we are sure many of you are going to try out this dish over the weekend, we are sure your you and your family will love this brilliant dish. So go ahead, check out this recipe and tell us how much you loved it! To anyone who has had the luck of tasting a pakoda, the very mention of it makes the mouth water. And when made with organic ingredients the taste is enhanced, it is good for your body and also for the earth and environment. 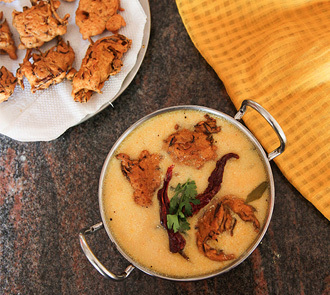 This Pakoda Kadhi recipe is best paired with plain basmati rice and can definitely be one of the most sumptuous and well balanced meals that you may have eaten. You can Enjoy these pakodas with your afternoon or evening drink or relish them dunked in the kadhi, whichever suits your style. So don’t waste any more time, head to your kitchen and try out this amazing recipe today. 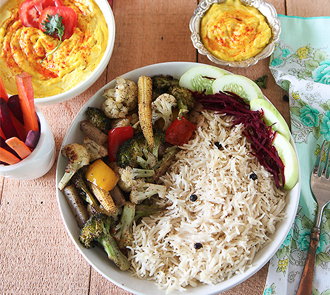 ​If you are looking to replace rice from your diet look no further, today’s recipe is just what you need. Little Millet Pulao is delicious pulao recipe​ and it has the nutritious benifits of Little millet which is lower in Glycemic Index value as compared to rice and is a gluten-free grain. 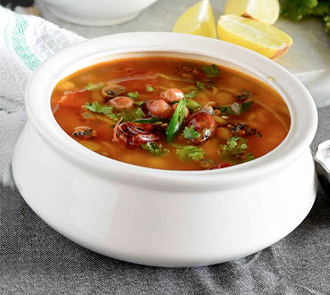 Keeping these one pot dishes healthy and nutritious is another challenge, That’s why one must keep trying such dishes which are simple but comforting and taste like absolute heaven. So don’t wait any longer, just try this fabulous dish today! These cookies are slightly crisp around the edges and have a soft centre that is a delight to sink your teeth in. These cookies taste best when warm out of the oven and they make your whole house smell like peanut butter. 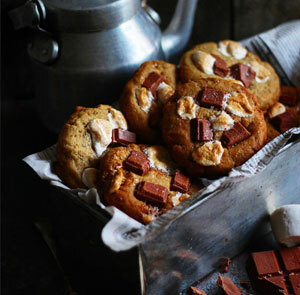 So if you are a cookie fan then this recipe will make you go gaga. The recipe for today is a yum delicious Chocolate and Ragi pancakes with tasty fruits and a generous drizzle of Himalayan Honey. This recipe presented to us by Rekha Kakkar is truly a spectacular dish that anyone would love to sink their teeth into. It is a must try for all those people who want to indulge into a yum and healthy dish with the goodness of@24mantraorganic Ragi flour and Honey. If you love pancakes then this is one recipe that you should absolutely try out over the weekend. The smokiness of Organic Jaggery from 24 Mantra Organics. Topped with walnuts, cranberries and a dollop of yogurt, its a perfectly balanced, elegant dessert you can serve your guests or just eat on your own as you cozy up on the couch for a late night Netflix session. This dish is sure to tickle your taste buds and give you a sense of ultimate satisfaction. Don’t miss out on this beautiful recipe and try it out today. 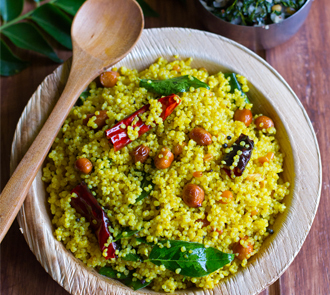 I used 24 Mantra Organic foxtail millet in this recipe as it’s my favorite and I love its nutty taste says “Radhika Subramanian” Author of Tickling Palates. She wondered how cool it would be if we can make a recipe into a grab and go wholesome meal. Some cooked millets, some protein and some nice masalas are all the things you require for this splendid recipe. You can try your own variations by using paneer, cooked chickpeas, kidney beans or sprouted moong beans if you want to add other forms of protein. 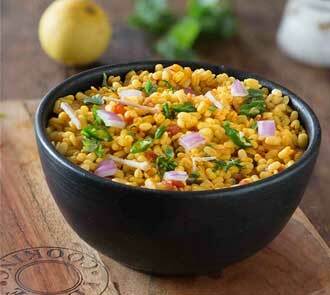 Try this recipe today and tell us what was the secret ingredient that you used in your curried millet recipe. Ask any South Indian food lover, what their favorite breakfast dish is, and we are sure that “Dosa” will definitely feature on that list. 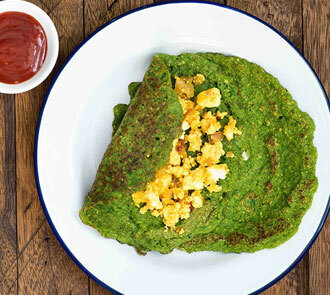 But have ever tried a millet dosa? 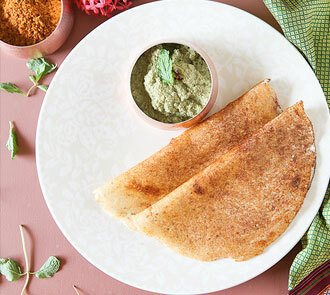 Not only is this a healthy option but the combination of a millet dosa and Pudina chutney is truly spectacular. So now you can be rest assured that you will be eating something extremely tasty without forgoing the health and nutrition benefits. 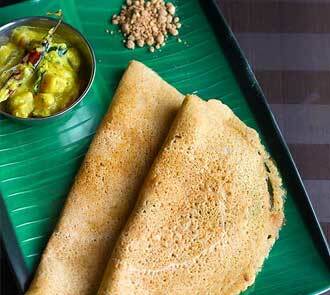 So try it out today and tell us what you think of this awesome Little Millet Dosa recipe. What more do you need in life, a world class dessert with a flavour so good that it will make your taste buds tingle by just thinking about it. This lovely organic vanilla lime pannacotta with honey saffron gelee is a very sought after Italian dish and the textures, tantalizing taste and flavours of this dish is enough to get your heart racing. As always, the Organic Honey is the star of the show and the honey saffron glee is definitely the show stopper. Don’t forget to tell us how much you guys liked this beautiful recipe. 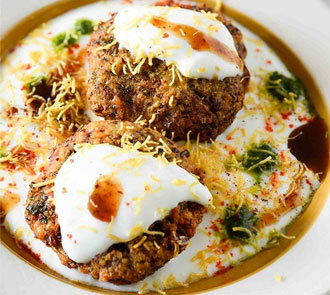 Crispy Tangy and spicy Tikki Chaat recipe, with a delicious and healthy twist. Easy to make, chatpata lip smacking dish that every one will enjoy. 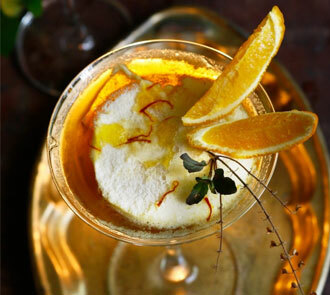 So go ahead, brighten your Diwali celebration with this zesty surprise. This recipe will not only take you back to your childhood days, but we are sure that this recipe will get your kids at the dinner table within a matter of a couple of minutes. So don’t wait any longer, and get cracking. Tell us how your Chatt experience was this Diwali with this extremely delightful recipe. 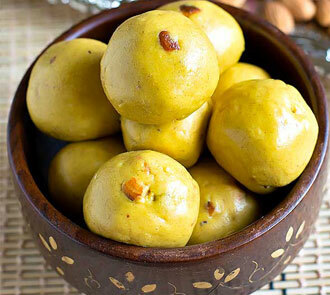 These yellow balls of heaven can easily become your go to treat this festive season. 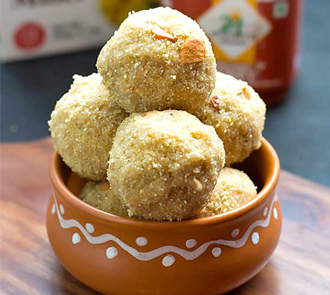 This extremely easy to make and tasty laddu can be made within a matter of a few minutes and will keep your kids coming back for more and more. Filled with some extremely nutritious and fibrous Organic dry fruits, they make for a great energy booster. Apart from that the sattu ka atta also makes it that much healthier. Don’t hesitate to try this incredibly tasty laddu and tell us what ingredients you added to give the recipe your special touch. “24 mantra organic sona masuri rice one of my most favorite varieties of rice” Says Anushruti RK. Dont miss out on this easy to make superb dish and let your taste buds take you back to your childhood in your grandmothers kitchen where everything tasted link heaven. Witness the creation of an exquisite south Indian meal that you can never forget. 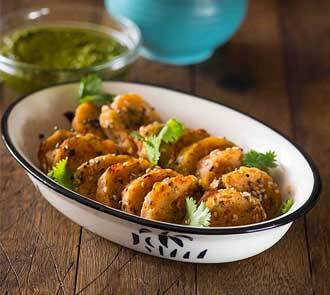 Have this with cucumber or tomato raita, it becomes a hearty meal that is sure to appease your palate. 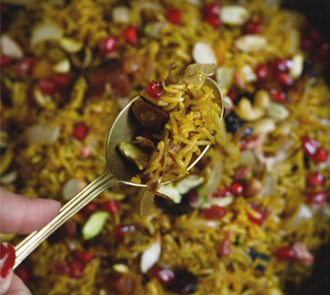 Deliciously fruit and dry fruit Organic Persian jewelled Rice can easily take the centre stage in any festive meal. Slightly sweet, aromatic, and packed with high levels of nutrition and fibre, this dish can satisfy any one’s craving this Festive season. Don’t forget to try out this recipe by Swayampurna Mishra author of lapetitchef and do let us know your experience while making this dish. Bored of your regular everyday breakfast routine, Fear no more you are at the right place! This Organic Ragi Flakes Upma recipe is simple easy to make and really makes for an energized kick start for your day. Don’t hesitate, try this recipe presented to us by Rekha Kakkar and tell us the other ingredients that you experimented with. 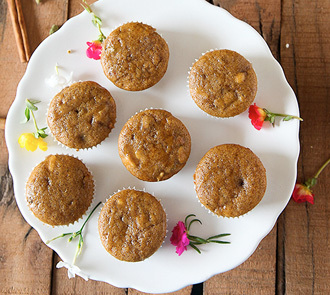 This article is a must read for anyone trying out this recipe as you hear how Radhika Subramanian tells you exactly what you need to make this amazingly soft and moist Whole Wheat Bran Apple Muffin. Whats even better is that this is complete guilt free indulgence given the fact that this dish gives you your daily dose of fibre and omega 3 fatty acids and is packed with the nutritional powers to kick start your day, or can even be had as a yum tea snack. 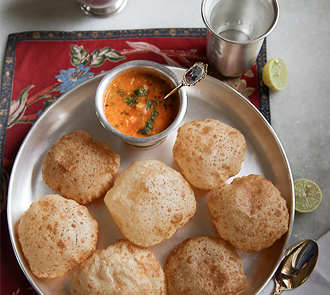 If there is anyone who can teach the world how to make the perfect puri then it can only be Anushruti RK. Puris that don’t deflate and retain their shape from the frying pan to the plate. With some of the most amazing tips to roll the perfect puris, this article can clearly become your guide book to making the yummiest and fluffiest balls of heaven. Partnering them with shrikhand or aamras makes for one of the most delicious treats you can ever imagine. Tell us what you like to have with your yummy, fluffy, healthy 24 Mantra Organic Puris? 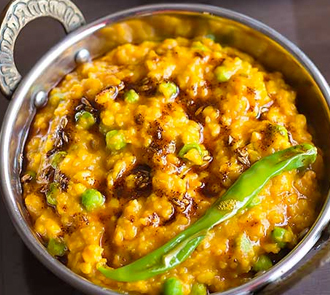 There is nothing more delightful than an Organic Gujarati Dal made with fried peanuts and ghee tempering to set the perfect mood for your palate. The balance of the sweet and sour of this simple everyday dish will is all one needs for a healthy organic nutritious diet. 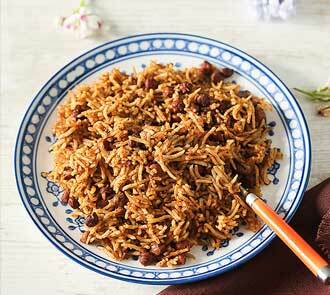 This dish paired with organic red rice is a splendid combination and is a must try recipe. Millets are Ancient Grains that mankind has known their nutrition value for centuries. They are naturally gluten – free. Low on carbs and high on fiber. 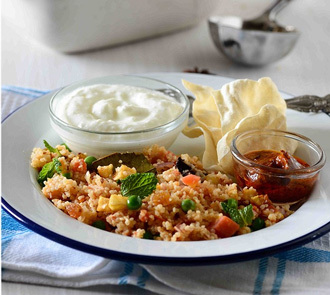 Millets are ideal for diabetics looking for an alternative grain to rice. 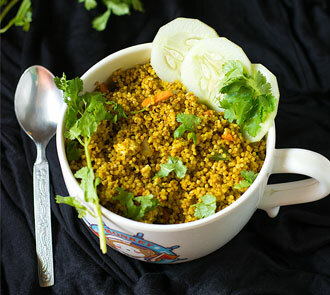 Check out this amazing recipe by Radhika Subramanian and tell us some interesting variations of Millets that you have incorporated in your diet. Here is a fantastic dish that all of you must try out this festive season. It is simple, sweet, and can bring a smile on anyone’s face. The best part of this dish is that it can be served hot of cold based on your preference. 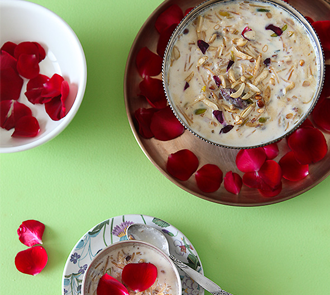 Seviyan kheer with milk, sugar, cardamom and saffron packed with a whole lot of organic goodness is not something that you can afford to miss. So don’t waste any more time, just click on the link below and try out this beautiful dish. And remember to tell us the different variations of the dish that you tried at home. 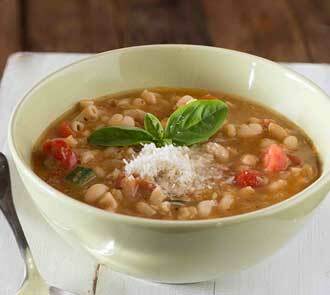 Refresh your weekend with a warm, tasty, healthy, organic, “Detox Lentil Soup”. 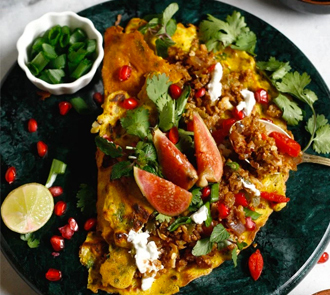 This Thai style dish can be how you kick start your day or can even be had as an energy booster in the evenings, especially when you’ve got a lot of work to get done. We’d like to thank “Swayampurna Mishra” for creating a very homely, simple, nutritious and well balanced dish with our 24 Mantra Organic ingredients. 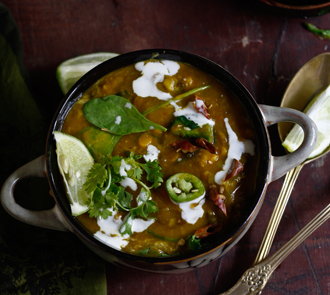 So hurry up, read the complete recipe & try out this “Organic Thai Detox Soup”. Oh, and don’t forget to fill us in on how it made a difference to your day. 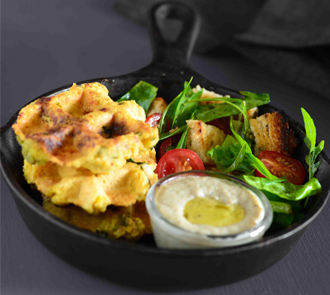 Do you know how tasty an Organic Falafel Waffles with a spectacular Baba Ganoush dip would be? This mediterranean dish could satisfy any one’s craving for indulgence without losing out on the health benefits. This dish presented by Rekha Kakkar will be sure to tingle your taste buds and take you through a truly organic experience. Try out this brilliant recipe and tell us what you think. 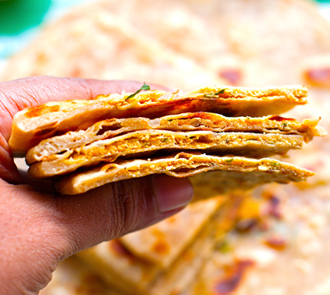 Have you ever tasted an Organic Sattu Paratha ? Perhaps popular in Bihar and Uttar Pradesh… It is healthy, nutritious and delightfully different! 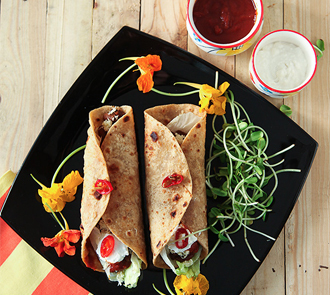 Now Tickling Palates and 24 Mantra Organic take you on a discovery of Organic Sattu Paratha. Get ready. Here is a recipe with step by step photos. These shallow fried flat breads are a speciality of the Bihar region where the paratha is stuffed with a mildly spiced roasted gram flour filling that makes a great breakfast option.